I found this recipe on page 11 of the Taste of Home Holiday Christmas Cookies & Candies magazine. It can also be found here. 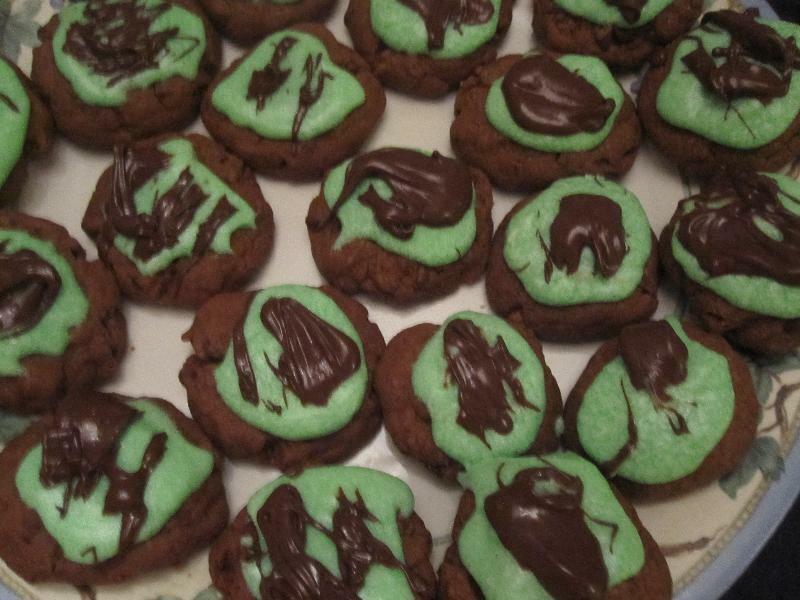 My friend Laurin made these at my annual Christmas cookie baking day. X Featured sponsor Bake Some Love with Nestlé® Nothing says ?I love you? like fresh baked Nestlé® Toll House® chocolate chip cookies. Who would you bake some love for? In a large bowl, cream the butter and confectioners' sugar until it is light and fluffy. Beat in the chocolate and the extract. Drop the dough by tablespoonfuls 2 in. apart on ungreased baking sheets. Bake for 6-8 minutes or until firm. Meanwhile, combine the butter, confectioners' sugar, extract, food coloring and enough milk to achieve desired consistency; spread over the cooled cookies. Let the frosting set. In a microwave, melt chocolate chips and shortening; stir until smooth. Drizzle over cookies. Description: A chocolate minty dream!